CHARLESTON - Attorney General Patrick Morrisey today announced that a new bear has joined the ranks of the Attorney General’s Office. The 200-pound sow was harvested on Dec. 14, 2012, by then-17-year-old Miranda Ware of Upshur County. Ware, the daughter of Kevin and Mary Ware, and the West Virginia Bear Hunters Association are loaning the bear to the Office for a year. Next year, the Association hopes to loan a different bear for display. Ware’s bear is on display in the east wing rotunda in front of the Attorney General’s Office. The sow was one of 52 bears harvested in West Virginia on Dec. 14, 2012, according to the West Virginia Division of Natural Resources. It is estimated the bear was four years old, although its exact age is not known. Ware said she was honored to have her bear at the Capitol. The Ware bear will join a black bear already on display in front of the Attorney General’s reception room. Earlier this month, the older bear was vandalized and part of its paw was removed. Since then, the Office of the Attorney General has implemented measures to ensure both bears are safe and not mistreated. 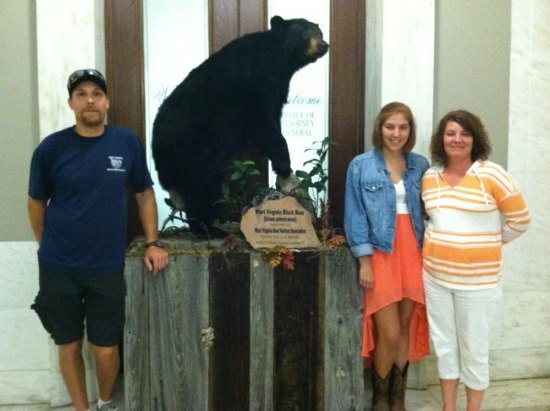 Eric Beck, president of the West Virginia Bear Hunters Association, said his group was eager to assist the Attorney General’s Office in getting a new bear.